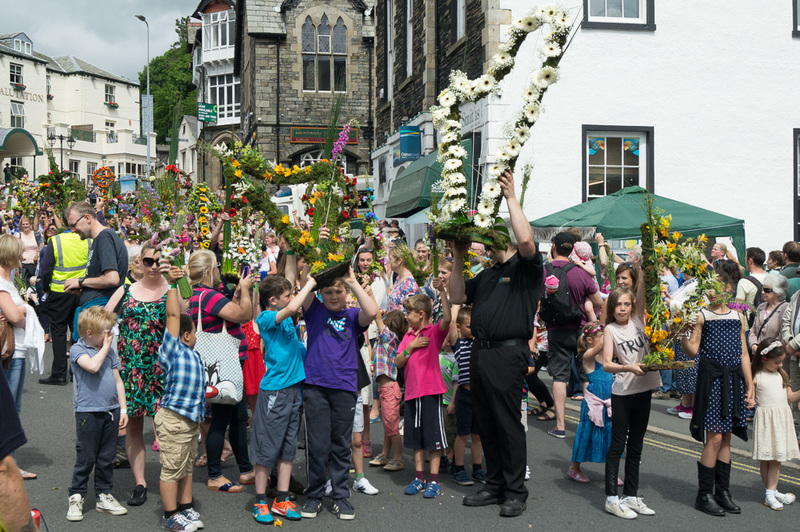 The annual Ambleside Rushbearing procession usually takes place on the first Saturday of July. I hadn’t seen it before, so arrived early (drivers are advised by Ambleside Online to avoid the area on that day between 2.30pm and 3.30pm) to experience this little bit of Lakeland tradition. Clearly, the first a number of visitors knew of the Rushbearing was when a police officer could be seen stopping cars by the mini-roundabout outside the Armitt Museum, at which point the beat of a loud drum could be heard in the distance. This was met with a slightly bewildered, ‘what’s going on?’, from one tourist stood a few metres away from me. In fact, I heard several similar exclamations as I made my way round the town to capture more photos! 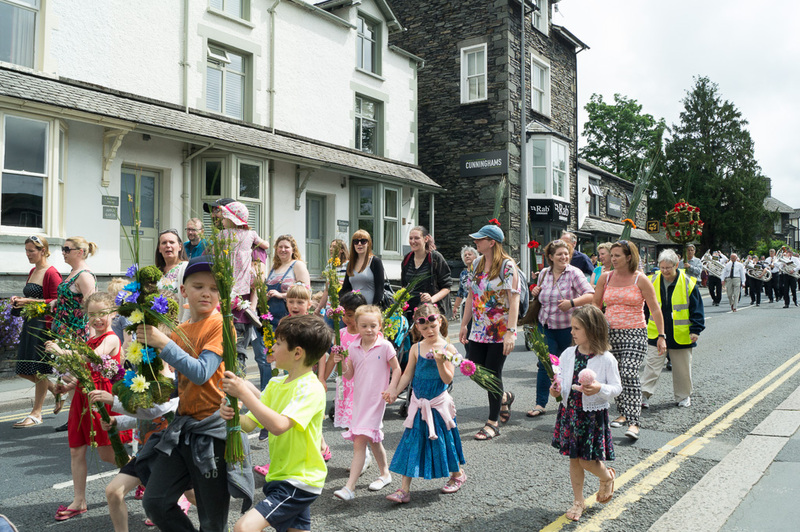 According to Ambleside Online, the Rushbearing procession is a festival celebration which is based on the ancient annual custom of replacing the rushes on the earth floors of churches. Very few places still continue the tradition, but in Ambleside the Rushbearing is now a community event. The procession is accompanied by Burneside Brass Band, and makes its way around Ambleside’s centre before stopping briefly in the Market Place. Here, the ‘bearings’ are raised and then the traditional Ambleside Rushbearing hymn is sung. The procession finally heads to St Mary’s Church, where the bearings are displayed in the church and a short service is held. Although I didn’t go to the church service itself, I enjoyed seeing so many members of the community turn out to take part. It certainly got a great reaction from the many visitors wandering around that afternoon! And because it was so warm in the sunshine, I escaped the heat with a drink in one of my favourite little cafés, Café Treff, which has a nice big front window from which to watch the world go by! There are still some great traditional events taking place around the Lake District throughout the year. Which is your favourite and why? Let us know by leaving a comment below. 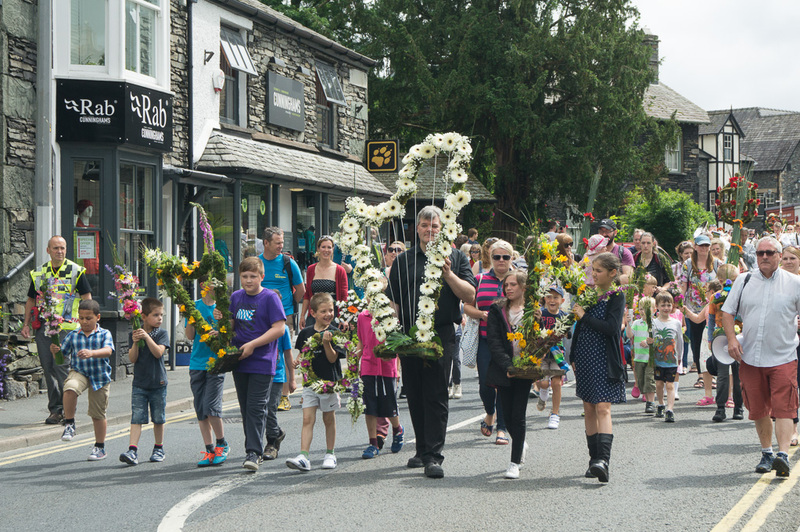 The nearby village of Grasmere also holds a rushbearing procession in July – this year’s event has now passed, but it’s definitely worth looking out for next year. Hi Janine – My name is Roger Borrell and I’m editor of Lancashire Life. We are running a piece in the July issue on the Ambleside rushbearing. We haven’t got any decent pictures – I wonder if you might be able to supply a couple of high res images? I’d happily byline them as coming from you blog.